So I didn’t exactly "rock" Boston. In fact, it fairly kicked my @$$. I arrived at the starting line extremely fit (and still am) and my 3:06:43 finish, though substantially off my sub-3 goal, was a very respectable debut. So I’m proud but sore. Motivated to do better. I ran a very solid 35K, right on target. But the marathon is 42K and those last four miles were extremely painful. 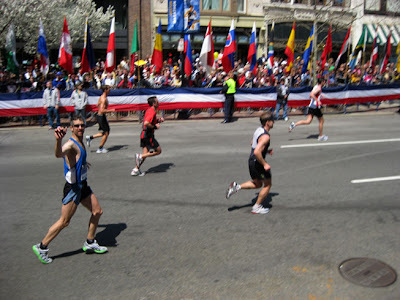 I was blacking out on my feet and swaying toward the sidelines and about a half mile short of the finish line, the infamous Boston leg cramps set in, a consequence of Boston’s famous down hills in which quads and hamstrings seize up extremely painfully. I managed to walk them off and rally for a proud jog to the finish line. I made some costly tactical errors that can be corrected so I’m fully confident that I will get under that 3-hour mark at a future race. I’m actually excited about the prospect. I never experienced that "never again" moment and I wanted another shot at the distance right after finishing, despite the suffering—and I’m still sore nearly a week later. The most important lesson I learned was humility. The marathon is serious business and no amount of toughness trumps preparation and smart execution. Let’s not get ahead of ourselves though. My body needs to heal, then we’ll think about the next attempt. I ran best when I focused on one step at a time and that’s how I’ll go forward: methodically, patiently, and for now, VERY slowly. Passerby: "You might ask yourself what happened to the kid wearing those shoes..."
Spring is in the air and Love is with it. 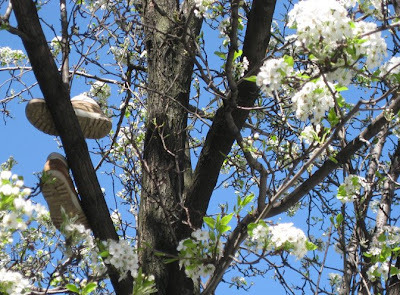 Along with shoes and plastic bags, the trees are full of bloom. Before stirring my tea (three blossom green tea served by a goddess debuting her new leopard print skirt) I sneak myself a little extra demitasse spoonful of honey. Mainline pollen and I’m not the only one imbibing. Those who are not sneezing and wheezing are sneaking corner-of-the-eye glances at each other behind their cool shades. The sky is perfectly blue, the colors bright, and possibilities are everywhere. Please! Don't Buy Our Art! mad dog will do the trick! Following on our revelatory visit to the Lower East Side galleries, we were wondering how we would find the Chelsea Scene. Let’s just say that it did nothing to change our Bowery Bullishness into 10th Avenue Ballyhoo. It’s not just that the spaces are cold, the art uber-commercial, the walks interminably long, the staff often quite frosty, and the neighborhood about as welcoming as the surface of the moon. All of that is beyond dispute. The new thing that I noticed, and I suppose that it’s always been there, is that many of the galleries actively don’t want most people to buy their art. Which seems kinda strange. It just got to be a bit much as we were bombing through the galleries in the Chelsea Terminal Building and almost none of the galleries listed prices on the "price list." My companion had to ask for the version of the price list that actually includes prices. When she jokingly probed the reasons for this double-list phenomenon (which made me wonder if there was more than one set of price lists behind that white window-wall) the attendant (who was really quite friendly) said that the gallery didn’t want to offend anyone by being too out-front with the prices. Offend who? 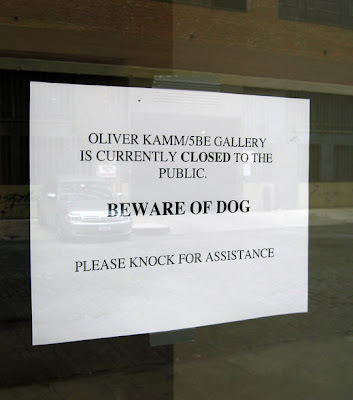 The one naive in the universe who mistakes the gallery for a museum? The artist who thinks the work should cost more? The jealous artist who thinks it’s worth less? The collector who spent five times more for lesser work in Miami? The coyness actually offended me alot more for two reasons. First, as an art collector, I want the process to be easy, invigorating, and I want to know that I’m not being $crewed. Secondly as an artist, I want to know that the galleries are out there trying to sell work. We [artists] cannot survive if they do not. So if a gallery’s mission is to get art out there and into people’s lives, making the act of collecting more difficult seems...counterintuitive. Well, it turns out that my sense offense was correct. What those galleries were doing was more than annoying; it was illegal. As retail establishments, galleries are required to post "in plain sight" the prices of all works for sale. Not "on request" and not behind the desk. In plain sight. Remember back in the 80’s, when galleries had to be sued into posting their prices? This is the same old $hit and presumably for the same reasons. After reading about the experiences people had back then, it wouldn’t surprise me if there were, in fact, multiple price lists for various "types" of customer. It used to happen all the time and probably still does. I don’t wish to make sweeping judgements: many of the galleries in Chelsea do everything exactly right. Many have been pushing art into public life for longer than I have been drawing breath and we can be thankful for all of them. And, let’s be honest, I would be thrilled to be represented by many (though certainly not all of them). But speaking in general terms, the district has a cold, unfriendly, and even outwardly hostile feeling that is not helpful to the cultivation of growing class of art collectors. It’s like the inexplicably angry stare of a supermodel on the runway. Don’t worry: I won’t offend by asking how much that skirt costs. I’ll visit someone who actually wants to do some business. I’m very excited to announce that I’ve been selected for a residency at the Virginia Center for Creative Arts (VCCA) for the month of August, 2008. Located in Amherst, VA, VCCA is just 40 miles from Springtree, the commune where Meredith grew up. It’s a double bonus: VCCA is a prestigious fellowship, and Meredith and Sebastian will be able to spend August nearby at Springtree, a place all three of us love—particularly in the summer. Meredith will be able to write in bucolic peace, Sebastian will run in fields and splash in creeks, and I will be able to look at many, many trees and have an amazing experience close to my family. Looks like you’ll be hearing a lot more from Countrymouse this summer!